I am always amazed at the rapid transition from winter to spring here in New England. One day you’re sitting by the wood stove cloaked in a heavy sweater and the next day the lawn needs mowing. When the buds on the trees begin to burst and the earliest of the spring flowers begin to bloom, there’s no holding them back. I grabbed my camera and took a little stroll around the garden this past weekend, the first one in May, to see what was happening. One of the first flowers to appear anywhere in the garden are those of Arabis caucasica (Caucasian Rockcress). We have several fairly sizable patches of Arabis that grow in between the rubble of a stone wall in a substrate that amounts to little more than a thin coating of leaves and pine needles. During spring cleanup we have to be very careful when raking leaves in this section of the garden so that we don't disturb the rather precarious hold that this little plant has on the earth. We have no idea where the plant came from. We didn't plant it. It may have escaped from a container but I don't recall that we ever used it in that way. Nevertheless, it showed up one day as a very small upstart just several inches in diameter, has continued to spread over the past several years and has now self-seeded to a second large patch several feet away. Most of the early blooming crocuses and snowdrops have past (see this post for more on those) but right on their heels came the daffodils. We have many clumps of daffodils planted throughout the garden. I love the subtle variations in their coloring from creamy whites to bright sunny yellows to those with centers that look like orange solar flares. I wish I knew the names of all the varieties but many of them were planted by Mrs. Parker, the previous owner of the farm. We think of her every time they begin to poke their heads out of the ground in the spring and they represent a nice connection to the farm's historical past. Click on any of the photos to enlarge. Another early blooming flower here is Pulsatilla vulgaris, the Pasque Flower, which in many areas blooms around Easter, thus its common name. It flowers a little later than Easter here in our corner of New England but its beautiful nodding, urn-shaped flowers and its silky, fern-like foliage make it unique. The foliage goes dormant mid-summer but it retains unusual ornamental seed heads that give the plant a lasting beauty throughout the season. It looks like all the snow has finally melted away from the shady north side of the house and the hellebores are looking beautiful. At the end of last season we added Helleborus 'Honey Hill Joy' to the stumpery garden (photos below), which has more "outfacing" flowers than most hellebores. It looks like it survived the winter just fine. 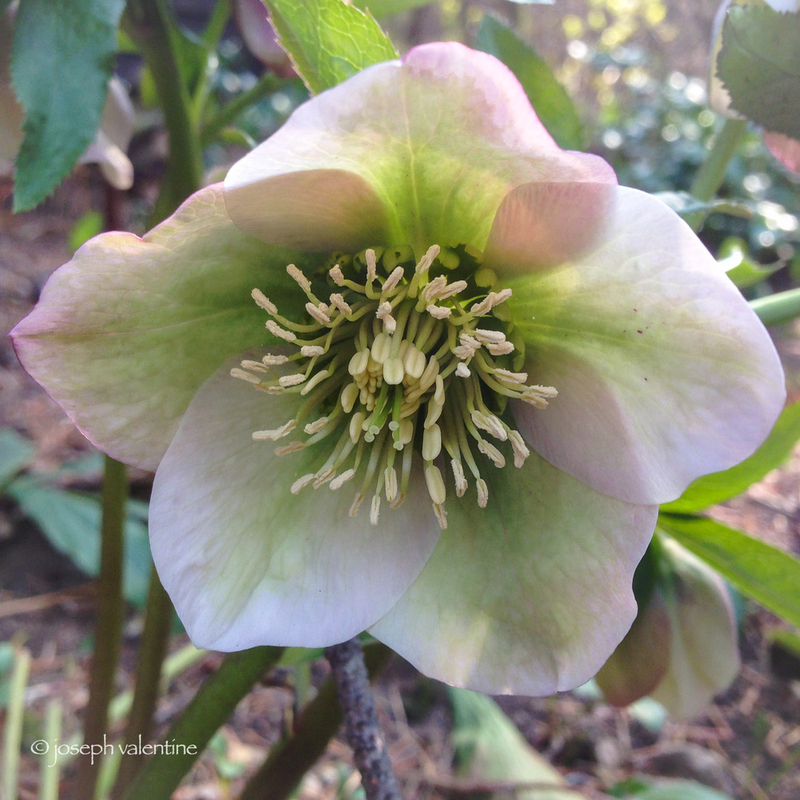 For more about my love of hellebores, see this post. ...and the Mukdenias are shooting up their tall white flowers in the stumpery and around the frog pool. The Bergenias are just beginning to flower in the lilac garden and the shady ground cover, Omphalodes verna is covered in the deep blue flowers that give the plant its common name of Blue-Eyed Mary. We have been establishing a ground cover of Waldsteinia ternata (Siberian Barren Strawberry) at the feet of a long row of espaliered apples in the potager and they are covered now with their bright and cheery yellow flowers. Waldsteinia ternata is often sold as a shade plant but it seems to be doing just fine in this rather sunny section of the potager. ...and there are some stranger looking things showing up that someone like Cousin It from the Adams Family would be quite proud to have in his garden; like this hair-covered Syneilesis aconitifolia (Shredded Umbrella Plant) as it forces its way out of the ground. Most of the trees are just beginning to leaf out but one of the most interesting to watch over the past several weeks has been the Leonard Messel Magnolia. Its fuzzy flower buds have looked like they have been ready to burst for weeks. And, once the flowers begin to unfold, they transition through a range of beautiful colors, from the deepest to the palest of pinks. It's no wonder that May has been a time to celebrate since pre-christian days when thanks were given to Flora, the Roman goddess of flowers. It truly is a time when things are blooming most recklessly! Happy May Day! Dance Around The Maypole, Pieter Bruegel The Younger (1564-1637), ca. 1625-1630, Oil on Panel, Utah Museum of Fine Arts.